A Gulfstream G650 jet was damaged beyond repair in a takeoff accident at Roswell International Air Center Airport, NM (ROW). The two pilots and the two flight test engineers were fatally injured. The accident occurred during a planned one-engine-inoperative (OEI) takeoff when a stall on the right outboard wing produced a rolling moment that the flight crew was not able to control, which led to the right wingtip contacting the runway and the airplane departing the runway from the right side. After departing the runway, the airplane impacted a concrete structure and an airport weather station, resulting in extensive structural damage and a postcrash fire that completely consumed the fuselage and cabin interior. The National Transportation Safety Board's (NTSB) investigation of this accident found that the airplane stalled while lifting off the ground. As a result, the NTSB examined the role of "ground effect" on the airplane's performance. Ground effect refers to changes in the airflow over the airplane resulting from the proximity of the airplane to the ground. Ground effect results in increased lift and reduced drag at a given angle of attack (AOA) as well as a reduction in the stall AOA. In preparing for the G650 field performance flight tests, Gulfstream considered ground effect when predicting the airplane's takeoff performance capability but overestimated the in ground effect stall AOA. Consequently, the airplane's AOA threshold for stick shaker (stall warning) activation and the corresponding pitch limit indicator (on the primary flight display) were set too high, and the flight crew received no tactile or visual warning before the actual stall occurred. The accident flight was the third time that a right outboard wing stall occurred during G650 flight testing. Gulfstream did not determine (until after the accident) that the cause of two previous uncommanded roll events was a stall of the right outboard wing at a lower-than-expected AOA. (Similar to the accident circumstances, the two previous events occurred during liftoff; however, the right wingtip did not contact the runway during either of these events.) If Gulfstream had performed an in-depth aerodynamic analysis of these events shortly after they occurred, the company could have recognized before the accident that the actual in-ground-effect stall AOA was lower than predicted. During field performance testing before the accident, the G650 consistently exceeded target takeoff safety speeds (V2). V2 is the speed that an airplane attains at or before a height above the ground of 35 feet with one engine inoperative. Gulfstream needed to resolve these V2 exceedances because achieving the planned V2 speeds was necessary to maintain the airplane's 6,000-foot takeoff performance guarantee (at standard sea level conditions). If the G650 did not meet this takeoff performance guarantee, then the airplane could only operate on longer runways. However, a key assumption that Gulfstream used to develop takeoff speeds was flawed and resulted in V2 speeds that were too low and takeoff distances that were longer than anticipated. Rather than determining the root cause for the V2 exceedance problem, Gulfstream attempted to reduce the V2 speeds and the takeoff distances by modifying the piloting technique used to rotate the airplane for takeoff. Further, Gulfstream did not validate the speeds using a simulation or physics-based dynamic analysis before or during field performance testing. If the company had done so, then it could have recognized that the target V2 speeds could not be achieved even with the modified piloting technique. In addition, the difficulties in achieving the target V2 speeds were exacerbated in late March 2011 when the company reduced the target pitch angle for some takeoff tests without an accompanying increase in the takeoff speeds. Gulfstream maintained an aggressive schedule for the G650 flight test program so that the company could obtain Federal Aviation Administration (FAA) type certification by the third quarter of 2011. The schedule pressure, combined with inadequately developed organizational processes for technical oversight and safety management, led to a strong focus on keeping the program moving and a reluctance to challenge key assumptions and highlight anomalous airplane behavior during tests that could slow the pace of the program. These factors likely contributed to key errors, including the development of unachievable takeoff speeds, as well as the superficial review of the two previous uncommanded roll events, which allowed the company's overestimation of the in-ground-effect stall AOA to remain undetected. PROBABLE CAUSE: "The National Transportation Safety Board determines that the cause of this accident was an aerodynamic stall and subsequent uncommanded roll during a one engine-inoperative takeoff flight test, which were the result of (1) Gulfstream's failure to properly develop and validate takeoff speeds for the flight tests and recognize and correct the takeoff safety speed (V2) error during previous G650 flight tests, (2) the G650 flight test team's persistent and increasingly aggressive attempts to achieve V2 speeds that were erroneously low, and (3) Gulfstream's inadequate investigation of previous G650 uncommanded roll events, which indicated that the company's estimated stall angle of attack while the airplane was in ground effect was too high. 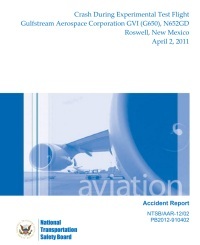 Contributing to the accident was Gulfstream's failure to effectively manage the G650 flight test program by pursuing an aggressive program schedule without ensuring that the roles and responsibilities of team members had been appropriately defined and implemented, engineering processes had received sufficient technical planning and oversight, potential hazards had been fully identified, and appropriate risk controls had been implemented and were functioning as intended."